Oh the days and weeks speed by, I can't believe another weekend is over and we are heading for the middle of June. We worked on several house projects, attacked the usual laundry towers and I attempted to be organized. The organization is actually helping-I am finding more time to work, and actually feeling more relaxed even though my schedule has revved up monster-truck style. I also felt a little sad that I can't get around the interwebs to visit everyone as often as I have in the past. The reason for this shift is good-more work on the art front and children developing their own interests, but still . . . . This weekend was filled with some exploring and gardening-Greg planting our Thumbelina sized tomatoes. Poor things. Next season plant the seeds in March Angie, March. On Saturday we went to the Mark Twain House in Hartford. What a beautiful estate. Twain was an incredible man; he lived quite the life. We learned a lot about the Twain family's lifestyle, politics, more details about their attitudes towards race and justice, Twain's auburn colored hair, decorating preferences and how they existed and celebrated life-very interesting. We took a carriage ride and listened to "Abe Lincoln" read several of his addresses and letters. They chose an excellent actor for the part of Lincoln. Later, Greg and I took turns to visit the Race, Rage and Redemption and A Sound Heart and Deformed Conscience exhibits. It is too intense for little kids. It was almost too intense for me. If you are in the area, you should definitely see this exhibit. We also took a tour of the Harriet Beecher Stowe House. She lived a few hundred yards from Twain. She was also an incredible person, not to mention that she was the mother of twins too. The story behind her book Uncle Tom's Cabin was fascinating. As with everything people have a hard time confronting, the powers that be misrepresented the story, turning it into a 'comedy' of sorts for stage and film while contorting the character of Tom, twisting him into a weak, lost, undignified simpleton. Again, if you have the opportunity to visit the museum and learn more about Stowe and her book, take advantage of it. Sunday we ventured out to our town's local arts and crafts fair. Elijah and Helena explored the jewelry makers' tents and asked all kinds of questions about the artists' technique and materials. They were also quite impressed with a wood artist's creations. I must say I love these events and being around people who create and celebrate the handmade. The most nerve-wracking time for me was watching Helena and Elijah take their first ferris wheel ride ever, and they did it alone. Doran begged to go down one of those Super Slides which I think he kind of regretted as it took him a long time to let go. We didn't stay after the three kids took their rides as Eden was miffed because she couldn't ride anything. Also those ride tickets for were crazily expensive ($2 for 1 ticket and most good rides were 2 tickets per person). Yipe. 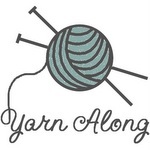 Joining Ginny for the lovely yarn along . . . . The second mitt is longer. I'll be able to bind off in a few rows. It's funny how the second thumb hole was so much easier than the first and dare I say the pattern and the look of the hole make sense. Next I will make up the actual thumbs. Let's hope my they knit up nice and easily. I don't want to bore you this week so that's it for my knitting report. So I suppose I'll issue my second Gross Alert. Are you alerted? This has got to be a record for yarn along. I am still reading If Walls Could Talk. This book is incredibly interesting. I am now onto the subjects of bathrooms and makeup. It seems that for a while we just went to the bathroom anywhere and everywhere and in front of anybody (this includes a French noblewoman who never missed a chance to do her business in front of an audience). Castle dwellers asked Henry VIII for favors while he was at his velvet-covered stool because he was usually very pleasant and agreeable at those times. One of my favorite names for a bathroom is "The Great House of Easement" at Hampton Court; this was a communal toilet that sat up to fourteen people. Apparently the location of the Easement house wasn't convenient and people at court would relieve themselves in passages in the castle, so much so that crosses were chalked on the wall in order to discourage people from descecrating the cross. You can't make this stuff up. I think I will spare you and not go into what people used for toilet paper, except that it wasn't paper, and the job description of Night Men. Grossness Over. This book is so fascinating. I am sure those of you who showed interest last week will enjoy it very much. People don't talk about this stuff so it's hard to know how we took care of ourselves in the past. That's it for me. What are you reading and making this week? Thank you all so very much for your beautiful compliments on my sketchbook last week. You all make me stand a little straighter and feel a little braver. Thank you. I completed this commission about a week ago. Commissions always tend to stress me out a bit as I am sure they do for most artists. The patron wanted me to interpret a special place in Vermont for her. She used to rent a carriage house there quite often. In doing so, she became close to the mistress of the premises-an unlikely friendship, but a strong and beautiful one. Her dog passed away while she was there one season and is buried on the property. She never returned to the carriage house after that loss. Of course this place holds many dear memories. So taking this information, some photographs and directions to use a Monet-inspired palette, I made several studies trying out all kinds of ideas and compositions. Finally I made this painting. I always see the mistakes, but she was very happy and touched and for that I am humbled and grateful. What challenges are you taking on lately? The painting is too large to fit on any home scanner, so please excuse the fuzziness. Can you spot the two dogs? Have a wonderful weekend my friends. And again thank you all for your incredible support and kindness. Presently, I am trying to capture the essence or impression of my subjects. It's not the easiest thing to be sketchy, at least for me. I think relaxing more while I paint would improve things. I wish you all much joy and contentment in whatever you are practicing. Everyone had such lovely and beautiful practices; thanks for sharing what you are working on with others. It is always inspiring. This weekend we are hoping to mostly stay near to the roost. Helena will participate in a Memorial Day parade and we'll be lighting a candle to remember those who have sacrificed so much. What are you up to this weekend? Well, I am off to deliver my second commission, yay! I'm feeling a bit nervous about presenting it to her, hope she likes it. Have a lovely weekend. I'll be back at this space on Tuesday, hope to see you then. Simple sketch of two ladies-working on impressions. . . .
A peek at my sketchbook. . . I need to start drawing and painting more so I'll be sharing my sketchbook pages in whatever state they are in at the moment, finished or unfinished. It's unfinished this week. I am hoping this will get more drawing more. Practice, practice, practice. What are you practicing lately? Have a fantabulous weekend friends. It was Amanda over at Soulemama who said she tries to remember that one person's mess is another person's progress. I would add that one person's mess is another person's process . The other day I was able to work in my studio and noticed I had a lot of process going on; it's a good thing though. Hopefully with more time doing the work, I'll have some things to show you soon. Have a great Tuesday my friends! It's Wednesday; you know what to do . . . joining Ginny for yarn along. I finished the penguin-unbelievable. I am pretty stoked. The penguin was pretty easy as he was all garter stitch. This was a great confidence boosting project. I never imagined I would be knitting toys-ever. I am proud to say this one looks almost exactly like the one in the book. I am thinking for my next penguin, I'll add a bit of yellow-orange for the border so it will look more like an Emperor penguin. The pattern is from Itty Bitty Toys, one of the best knitting books I have come read. There is also a nice section with super-clear pictures of techniques like the kitchener stitch. I have the kiddos searching through the book for something to make next. So far Helena likes the lamb; Elijah is undecided; Doran says "yeah" to just about any project I show him, and Eden wants everything. She even made the hand motion over a photo with a large collection of the projects featured in the book. Me, I am partial to the knitted nesting boxes. I love boxes, plus I am always looking for pretty storage for various bits and pieces floating around my house. For my next project though, I am making Valentine hearts from this pattern. Let's hope it works out. I have never knit front/back so this should prove interesting. While Eden loves her penguin, the look on her face is not from shock that I finished her toy, but the result of a dastardly cold. She is such a trooper-poor thing. I am still reading Just One Thing, and it's making a difference. For example, I was much calmer last week when I discovered I got the kids out of school early for a dentist appointment on the wrong day-a week early to be exact. Oops. In the past I would have berated myself for the goof, the "wasted" time, and added inconvenience. This time I gave myself a break and it felt good. It was nice for the kids to watch me make a mistake and not get upset about it. This week's intention is seeing the good in myself. The kids and I are still reading Heart and Soul. I'm learning new things too. We are also delving into Our White House simultaneously. We'll read about President Lincoln in Heart and Soul and then check out the "articles" about him and his family in Our White House. I love going to varying resources about the same subject with the kiddos. We are reading about slavery, Lincoln, abolitionists and free blacks in Heart and Soul. In Our White House, we learned how Lincoln "spoiled" his sons and that a free black woman, Elizabeth Keckly was Mrs. Lincoln's personal seamstress and close friend. She was the first person Mrs. Lincoln called for when President Lincoln was assassinated. This is some amazing stuff. Of course, I am a bit of a history nerd. What are you reading and making lately?